If the new colorless mana symbol is considered to represent a sixth color, it's perhaps not surprising that it gets its own "Charm" in the style of Mirage, Visions, Onslaught, Planar Chaos, etc. And what a Charm it is, too. The first mode might have been more relevant in Standard if there were still mana birds around, but there will certainly be times when you can buy some time by AWOL-ing a small creature. (And in larger card pools, don't forget what sort of physically-weak but gameplay-relevant creatures exist - Dark Confidant, Deceiver Exarch, and Spellskite are all valid targets for the first mode.) The rest of the card is, of course, pure advantage. Protecting a Reality Smasher from an imminent Crux of Fate is devastating. Early casting or more castings of powerful colorless creatures is possibly even more devastating. 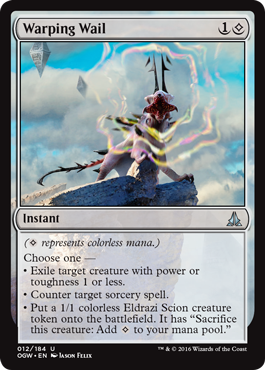 With spells like this on their side, it's no wonder Gideon needed five other planeswalkers to help fight the Eldrazi.